The University of Louisville School of Dentistry Advanced Education Program in Pediatric Dentistry is located in the Sam Swope Kosair Charities Centre, 982 Eastern Parkway. Residents offer treatment for our young patients who are between birth and 17 years of age. Special needs patients of any age are accepted. Services provided include preventive dentistry, cleanings, x-rays and fluoride treatments in addition to fillings, stainless steel crowns and extractions. 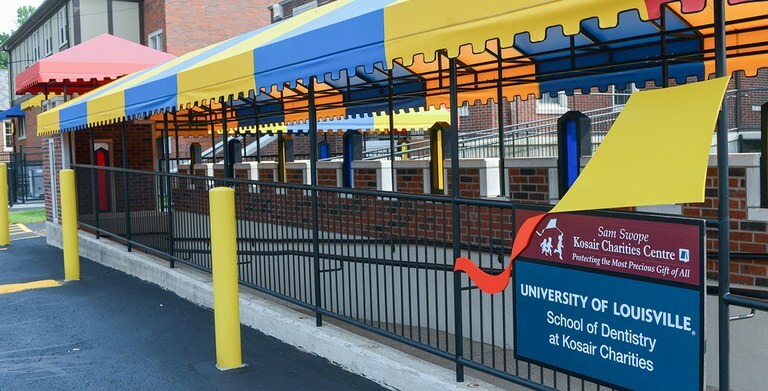 Emergencies or outpatient treatment is provided at Kosair Children's Hospital for very young children with excessive decay or special needs of any age. Treatment is provided by licensed dentists who desire to specialize in pediatric dentistry and have been selected for their two-year residency position from a large number of highly qualified applicants. For an appointment, please call 502-852-3544.